Hey guys! A bunch of writers are about to head into a month of writing intensely known as Camp NaNoWriMo. And in such of frenzy of scribbling down words, it's easy to forget our love of reading and words in general. I started to write seriously about half way through seventh grade. But that first semester of 7th grade, I read about 20 books a month. I think I read about 250 books total in 7th grade, and it was the most books I ever read in one year. Move forward a few years. Between November 2012 and December '13 I wrote just about 200,000 words. I finished writing the first draft of two novels and started a third. During that same span of 13 months I only read 50 books. That might seem like a lot, but remember a few years earlier I read 5 times that amount in a shorter amount of time. One of my goals in 2014 was to higher prioritize reading books. After 3 full months of trying to read more, I've read 26 books and am half way through 2 more. I feel like this means I'm somewhat qualified to give you some tips on reading more. I can read 300 pages in about 3.5 hours if I like the book. But give me required reading for school and it will take me an hour to get through 30 pages. If a book is a fast paced pager-turner, you'll read it faster and be more driven to finish it. At any given time, I like to be reading a physical novel and listening to an audio book. (Right now I'm reading Steelheart by Brandon Sanderson and listening to The Exiled Queen by Cinda Williams Chima. I like to pick an audio book that I've already read, so that if someone starts talking to me, I don't get totally lost and have to rewind.) I can listen to the audio book while I'm cleaning my room, doing the dishes, or baking cookies. Then I have some down time or a car trip and I pick up my real book. I also like having an ebook on my iPod touch. This lets me read while the people around me think I'm texting my friends (ha!) when I'm really just being a closet bookworm. 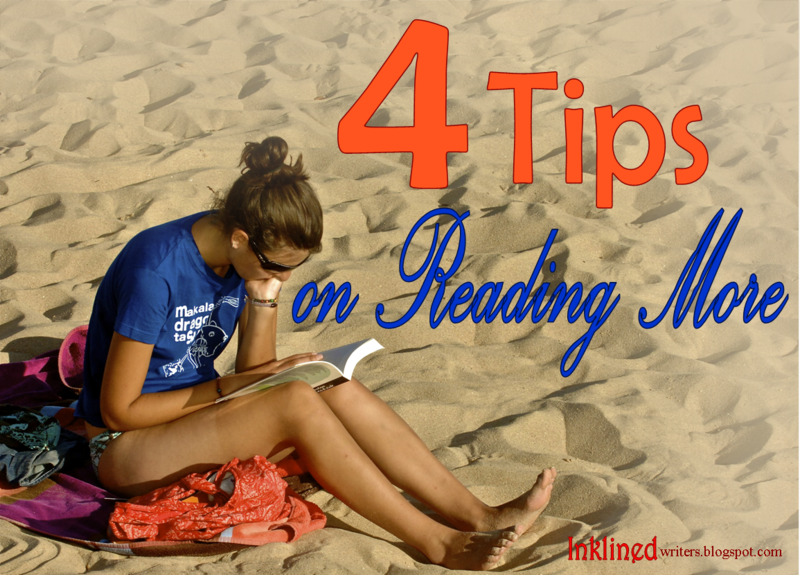 Reading in multiple formats means you hardly ever have an excuse to not read. One thing that I try to do is read at least 20 pages every morning. Normally I get sucked in and read more than 20 pages. But if not, 20 pages is normally at least a chapter every day and it's not hard to fit into your day. I feel like if I read a little bit in the morning, I'm way more likely to make time to read throughout the rest of the day. Sometimes you think you'll like a book only to find you don't. I was sure I'd love the book Tokyo Heist that I found at my library the other day. I got about 40 pages in and realized I didn't like the voice or the main character, and the plot wasn't moving fast enough for me. Thankfully, I'd grabbed 15 other books from my library's YA section, so I wasn't up a creek without a paddle. It actually forced me to read Stealheart which has so far been a very good thing. If you have some back-up books you'll be ready for an extra snow day, book you don't like, or book you poured through way faster than you expected. If you only have one book and you chose not to read it, you kind of have an excuse, but if you have 16 that you picked out for yourself, you should like at least one of them a little bit. Do you have a hard time balancing your reading and writing? Do you like to read more than one book at a time? Do you listen to audio books? Are there some tips you have for reading more? Leave a comment at talk to me! For the next month, I might only post on Mondays. You may get an occasional post on Thursday, but it will be more of an update type on Camp NaNo then a typical Inklined post. Hope you're okay with that. This is really helpful! I especially like the tip about listening to audio books. I recently made a TBR shelf - and it's been motivating me to get through more books! I definitely agree with what you said about audiobooks. Over the last few-months-and-a-year, I've been listening to them waaay more, mostly while I knit or do dishes. Sometimes it's the only way I get any books in because, yes, I do have a hard time balancing my reading, writing, and internet time. One other thought I have is to use reading as a reward. If there's something you really want to read, but you won't allow yourself to read it until you've written that thing that really needs to be written, it helps you stop procrastinating. Though I don't know how well that would work for everyone else . . . I operate under a rather reward-heavy process when I need to get stuff done. If that makes sense. I have used reading as a reward for homework before. For every half an hour or 45 minutes of school I do, I get to read one chapter. But I always get sucked in and finish the book instead of my school work. I think all writers can get in periods of writing where the slack on their reading. It's very easy to do, because we think of writing as a much more valuable pursuit than reading. Glad the post came at a good time for you, but I promise no spying was involved! I love the "have a shelf of unread books." That's so great! Having hard copies visible guilts/seduces you into opening the book. It does totally seduce you, doesn't it? What a great word to describe when books do to me! thanks for this. I have just taken up audio books because I don't have time to read, especially with a new job. thank you! I'm glad you liked it so much. Audio books are wonderful! And I don't know how nice your library is, but mine has a database of ebooks and audio books that you can download. It's great because the books just expire after 2 weeks, so no late fees! I don't think it's so much important to read so many books in one year as it is to read meaningful books, ones I'll learn from, both in writing and in life. And I like to force myself to read a good challenging book now and then, like a really big book from the 1800s. They say to read everything, and sometimes I just love to disappear into the past and forget about the modern age.